When diving, your ease of movement sends a message to the inhabitants of the ocean. Move smoothly and easily, and fish will believe you belong there. If your movements are clumsy and erratic, they will be wary of you. How fish react to you is one of the best measures of your smooth diving ability. If they scatter when you get near, you need to work on your body language and kicking technique. Navy Seals are taught that, “slow is smooth, and smooth is fast.” There’s no reason to rush anything. If you slow things down, you will avoid missteps. Not only that, but your breathing and heartrate will be lower, which is a huge advantage in the water. If scuba diving, you will conserve air. If freediving, you will be able to hold your breath longer. In either case, more bottom time translates into higher probability of landing that special fish you are looking for. Besides working on your diving technique, you might want to think about upgrading your fins. They are one of the most important pieces of equipment and will help you move smoothly. There have been many advances in technology in recent years. 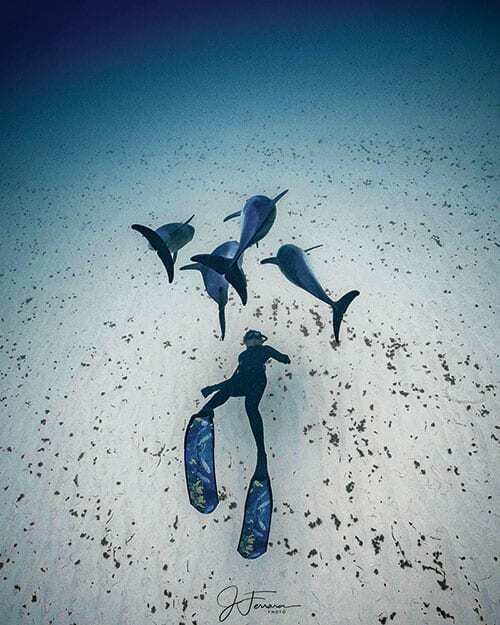 Fins tend to be lighter and longer, and freediving “longfins” tend to be sold separately. In other words, you buy the foot pockets and the blades from different manufacturers, so you can choose exactly what works for you. Some dive shops will marry the two for you, or you can assemble them yourself using marine glue. Sheri dives with the dolphins. Photo by J. Ferrara. When choosing foot pockets, the most important aspects are fit and comfort. When choosing blades, check out the newer carbon fiber materials, which are stronger, lighter and more efficient than plastic. Fiberglass blades are a less-expensive, more-durable option. They both come in different stiffnesses. Firm fins are efficient for going up and down. If diving all day with a lot of surface swimming, then softer blades would be more appropriate. The latest trends are toward striking, colorful designs and patterns. After all, we want fins that feel good and look good in our Instagram pics. Practice slow and smooth movements, and watch how fish react to you. Observe and imitate someone who is better than you. Have someone videotape you while diving so you can analyze yourself. Do leg-strengthening exercises. The stronger you are, the more effortless your kicking will be. Use long, smooth strides originating at the hip. When ascending, use a dolphin kick, which offers greater streamlining and engages more muscle groups including your core. Make sure you have the right amount of weight so you are not kicking to maintain buoyancy. Use a Lycra or neoprene sock/bootie to avoid blisters. Sheri is a world-record holder, host of Speargun Hunter, and producer of “The Blue Wild Ocean Adventure Expo” in Ft. Lauderdale, Fla. For more smooth diving and other tips, follow “Sheri Daye” and “The Blue Wild” on Facebook and Instagram.